Years ago, I walked into a supermarket in search of Bach Flowers. I knew very little, only that there were remedies for different mental and emotional states, for example; anxiety, jealousy, self-doubt, undue optimism or even arrogance. Going by the descriptions, I chose the ones that sounded like me. Since then I've discovered that my choice of remedies corresponds to the more influential signs in my birth chart: Moon in Capricorn, Past Life House in Cancer, Past and Present Life Suns in Aquarius (maybe I flunked and got a do-over?) Apparently, we can use our birth charts to narrow down the range of Bach Flowers, making the selection process easier. We can then leverage the healing qualities in the flowers to soften our limitations and unlock our strengths, which often coincide with our star signs. 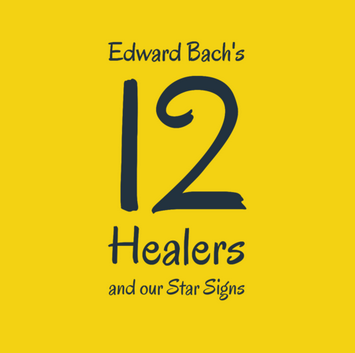 Below you'll find Edward Bach's original remedies, known as The Twelve Healers. Bach hypothesized that they corresponded to the Moon Sign in our birth charts. He didn't connect the dots, however, and the associations below are based on Peter Damien's book, The 12 Healers of the Zodiac, as described HERE. Before we continue, read Part 2 for an intro to Astrology, or this post won't make much sense. Also, I should mention that the descriptions below are my interpretations, read the official explanations HERE. Without further ado, the 12 Healers! For those of us who want things done yesterday, patience is a virtue worth cultivating. Relax your sense urgency so that it doesn't isolate, rush or frustrate relationships. Are you unusually discouraged by setbacks and obstacles? Do you feel like throwing in the towel when things go wrong? This essence can help put challenges in perspective. Do you look to others for permission, authority or wisdom? Cerato can help us trust our own inner guidance and personal power. This essence grounds the dreamers in reality, bringing our attention back from plans for a better life, to the present moment where we can exert our influence. Time to take action. Sometimes we can be so passionate about an idea that we speak of it continually, trying to get others to agree. The truth is relative and subjective, we can all learn from each other. For those who go out of their way to help others, to the point of neglecting themselves. Centaury reminds us that we matter, just as much as anyone else. Please prioritize yourself. Do you spend hours going over options before making a decision? eventually, we have to go for A or B, and commit to making it work. This essence can help us be more decisive. For Scorpio: Possessive or too protective of loved ones? Try Chicory. We've all heard of smother love. Sometimes we "love" others so much that we go to extremes to care for them and protect them. Chicory gives us space, independence and self-reliance. For Saggitarius: Expecting the worst? Find your peace with Agrimony. This personality hides "what lies beneath" well. They may be fearful of conflict, or riddled with anxiety and a sense of dread. Agrimony makes it easier for us to admit our feelings. For Capricorn: What are you afraid of? Find courage with Mimulus. Does your fear of heights keep your from climbing the Eiffel Tower? Or does maybe fear of lack leads to hoarding. Mimulus helps us relax, it's is for fear of concrete (if irrational) things. For Aquarius: Team building, sharing and friendship with Water Violet. Everything you need to know, you learned in Kindergarten. It's a reminder that sharing is caring, we can accomplish more in teams than on our own. It's about community building. For Pisces: Keep your calm in crisis situations with Rock Rose. Pisces is the most sensitive sign in the Zodiac. When we feel emotions acutely, we may freeze as a Self-Defense mechanism. It might be an underlying sense of terror, overwhelm or dread. Birth charts have a lot going on, with aspects or conjunctions playing the planets and signs off each other to dial up (or down) the effects. Go by your intuition and self-awareness when deciding which remedies to take. For example, my sun is in Aquarius but Water Violet wasn't my first choice. I haven't explored the Zodiac in depth as that would take ages and I'm still a beginner. If you'd like to know more about the meaning of the planets, signs or houses in your birth chart, visit CafeAstrology.com. See here for Sun Signs, Moon Signs and Nodes of the Moon/Past Lives. Tell us about your impressions in the comment box below, thank you!